Lots of Corn in Indiana! Yep, there’s definitely corn in Indiana. This is one of my favorite times of the year in the Midwest. The beginning of August always means a big, juicy crop of sweet corn from my in-laws farm in west central Indiana. Every year, we make at least two trips there to pick sweet corn. Everyone helps shuck the corn the same day we pick it because I think it’s best to put it up immediately. All hands are on deck in our rig to help shuck the corn and clean as many of the silks as possible. The next part is pretty messy and I usually do it outside where cleanup is easier. When cutting corn off the cob, the “milk” from the cob gets everywhere and is sticky when it dries. It also draws bugs so be sure to rinse everything off afterwards and hose off the ground so you don’t have an unwelcome pests later. Anyway, if you are going to freeze your corn off the cob, then you need to cut the corn off the cob. I’m don’t have any fancy equipment for this. Some people use a “corn knife” or a certain slicers. My tools are a cutting board, a good serrated knife and a big stainless steel bowl. 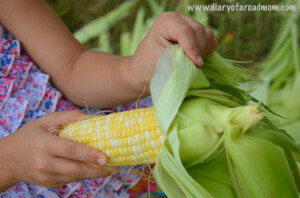 Stand each ear of corn on end and cut closely to the ear to remove the corn from the cob. I cut a couple ears at a time and then dump the kernels into the big stainless steel bowl. I also scrape each bare cob on the edge of my bowl so that any leftover milk is also captured into my recipe. Depending on the size of the ears, I usually cut 18-30 ears per batch. I usually cook 2-3 batches of this recipe at a time. Be sure to use a big, heavy aluminum pan when cooking the corn and stir often so it doesn’t burn or get stuck on the bottom. After the corn is cooked, I like to plunge the pan in a big sink (or bigger pan) full of ice to speed the cooling process. 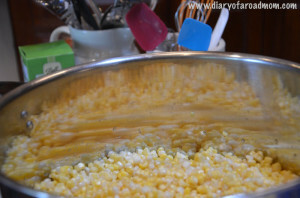 I also stir the cooling corn often to help it cool faster. Do not package the corn until it is completely cooled. I freeze my corn in quart Ziploc bags since we have a larger family but most people freeze this recipe in pint bags. Be sure to use freezer bags and label with the date so you can rotate your oldest corn first when getting it out of the freezer later. When I place my corn in the bags, I fill it to the top of the bag leaving about a good inch or so from the top. I make sure there is no air in the bag and that I get a good seal all the way across the closure. Wipe off the bag so it’s not sticky later and I flatten out the bag so that when it freezes, it freezes in a flat, smooth block of corn. This is also helpful if you want to stack the bags of corn in your freezer later. My final hint is that I freeze my bags on a cookie sheet so that it freezes flat and not with the ridges that it could mold to if laid flat on the freezer shelf (if its a wire shelf). When I put up corn, I don’t plan much else for the day. It’s a big, messy job but the results are so worth it! Having a big piping-hot bowl of freshly cooked sweet corn for Thanksgiving dinner or any day of the year will be a great reward for all the hard work!